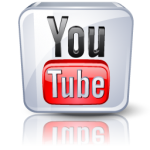 Here are all the information sheets and videos that we produced on different aspects of early language and literacy. 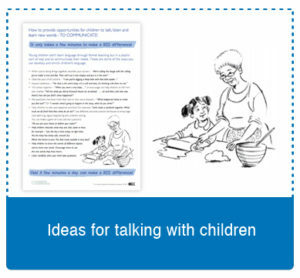 Print our ‘Make your own’ booklet with instructions for making inexpensive resources that encourage language development and make learning fun. Download a black and white version of the booklet here. 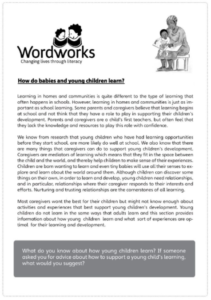 Download a full colour version of the booklet here. Note that this is a low res version to make it easier to print at home. 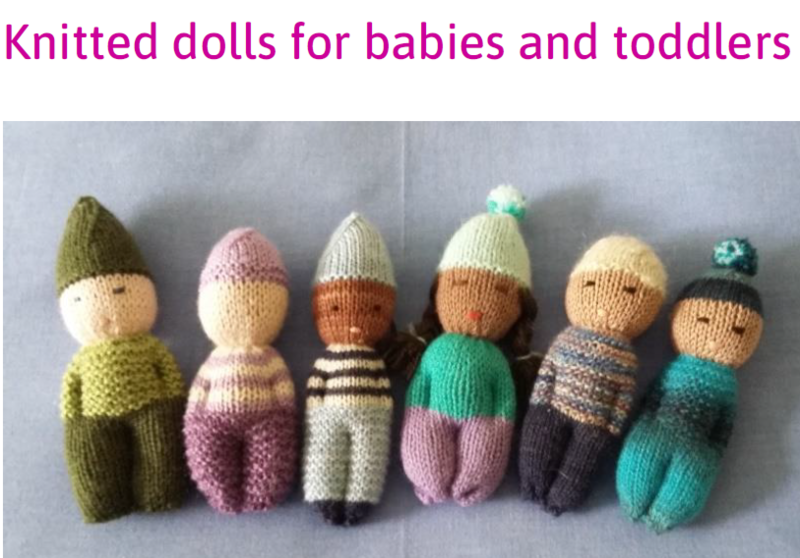 Download the knitting pattern here. 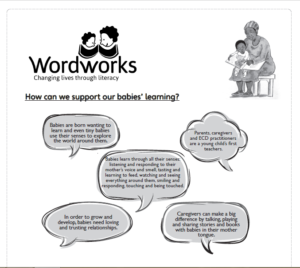 How can we support our babies’ learning? 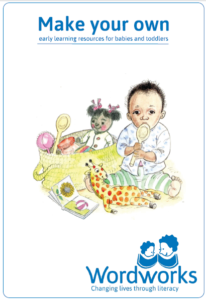 The ideas and activities in this leaflet can be used with babies and young children in ECD centres, playgroups and at home. Download this info sheet in English. 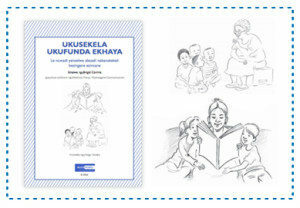 Download this info sheet in isiXhosa. 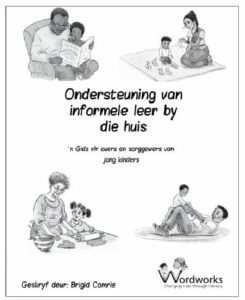 Download this info sheet in Afrikaans. 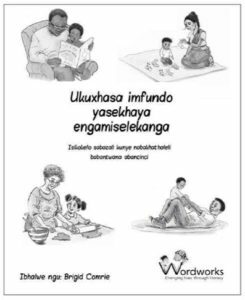 Download this info sheet in isiZulu. 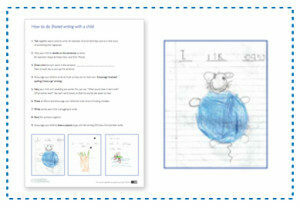 When children draw, they learn to put their thoughts on paper. This is an important step towards becoming a writer. 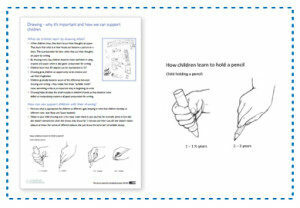 Download this handout for ideas on how to support young children’s drawing. 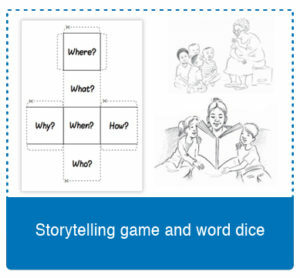 Young children learn new language through everyday conversations. 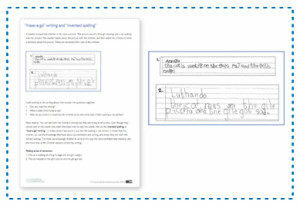 Use this handout for ideas on how to enrich your child’s language. 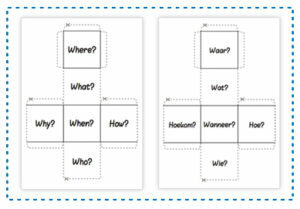 Download this handout to find out about a fun game to help stimulate conversation with children. 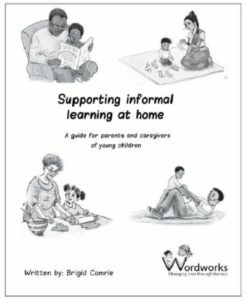 Click an image or button to download a 12-page booklet with practical suggestions for parents and caregivers on how to support children’s informal learning in the early years (4 – 7 years). What do you know about how young childern learn? If someone asked you for advice about how to support a young child’s learning what would you suggest? Download this info sheet to learn more.